The white tailed eagle - also known as the sea eagle or white-tailed sea eagle - is a huge bird with broad wings up to 245 cm (over 8 feet) wide. White-tailed eagles became extinct in Britain in the early 1900s and despite a lengthy re-introduction scheme, their numbers in Scotland are still very low. The work to reintroduce the species has been hampered by the theft of eggs. This has led to local initiatives, such as Mull Eagle Watch, to help protect eagle nests. The small population of white-tailed eagle in Britain is found only in the highlands and islands of the west of Scotland. 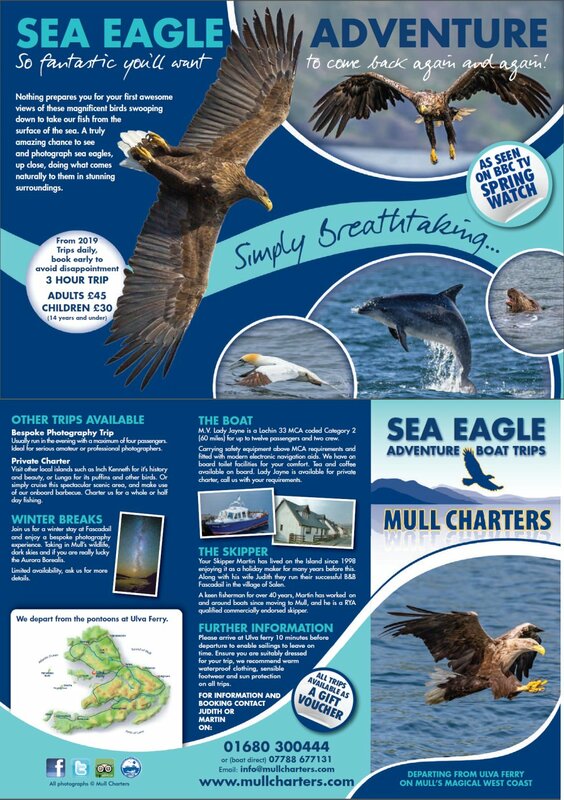 Scottish white-tailed eagles prefer sheltered lochs or sea lochs rather than exposed coastal sites. They also prefer to nest in trees rather than on cliffs. On average, their territories range from 30 - 70 km2, but much larger territories are possible depending on the availability of prey. In Britain, white-tailed eagles are non-migratory. Breeding adults stay close to their breeding territory throughout the year. Non-breeding birds may range quite widely to find sufficient food. Compared to smaller and shorter-lived birds, white-tailed eagles have a low reproductive rate, which has contributed to the slow growth in the population. White-tailed eagles normally breed at 5 - 6 years of age. In Scotland, they spend the winter in courtship and nest building, and eggs are laid in March. Females normally lay 1 - 2 eggs, which are incubated for about 38 days. Exceptionally, 3 young are raised from successful nests each year. Young birds remain in the nest for 10 - 13 weeks before fledging. Although they are capable of taking care of themselves about 30 days after leaving the nest, they will continue to beg for food from the adults for several months. The young eagle will then spend about 5 years in non-breeding areas, often in the company of other non-breeders. In birds of prey generally, up to 60 - 70% of all young that leave the nests will not survive their first winter. This figure is probably significantly lower for large raptors such as the white-tailed eagle, but a young eagle still faces a life or death struggle through its first winter. After surviving that first year, a young eagle may well then live for more than 20 years. Fish, sea birds and ducks are among the most important items in the white-tailed eagles' diet in most of their world range. When hunting for fish, the white-tailed eagles prefer to watch from a suitable perch then swoop and pluck the fish from the surface of the water without getting wet. The eagles also scavenge, scouring the shoreline for washed-up fish and often stealing food from other birds, such as osprey and animals, such as otter. White-tailed eagles have no natural predators in Britain. The only threat to the bird's continued re-colonisation in Scotland is from human activity, by poisoning or stealing eggs, and from degradation of habitat and food resources. The white-tailed eagle - also known as the sea eagle or white-tailed sea eagle - is a huge bird with broad wings up to 245 cm (over 8 feet) wide. White-tailed eagles became extinct in Britain in the early 1900s and despite a lengthy re-introduction scheme, their numbers in Scotland are still very low. The adult white-tailed eagle's huge size, relatively large pale buff coloured head, huge bill and short, wedge-shaped and pure white tail are very distinctive. Newly fledged young are much darker, gradually gaining adult plumage over 5 - 6 years. White-tailed eagle are quite vocal and call far more often than golden eagles. The call is a mixture of a bark and a yelp, and sounds rather strange coming from such an impressive bird. Reading historical accounts of the Golden Eagle on Skye is pretty depressing and that it survived as a breeding resident is nothing short of miraculous. Even when Baxter & Rintoul wrote the 'Birds of Scotland' 50 years ago it was said 'never to have been an abundant bird on Skye'.